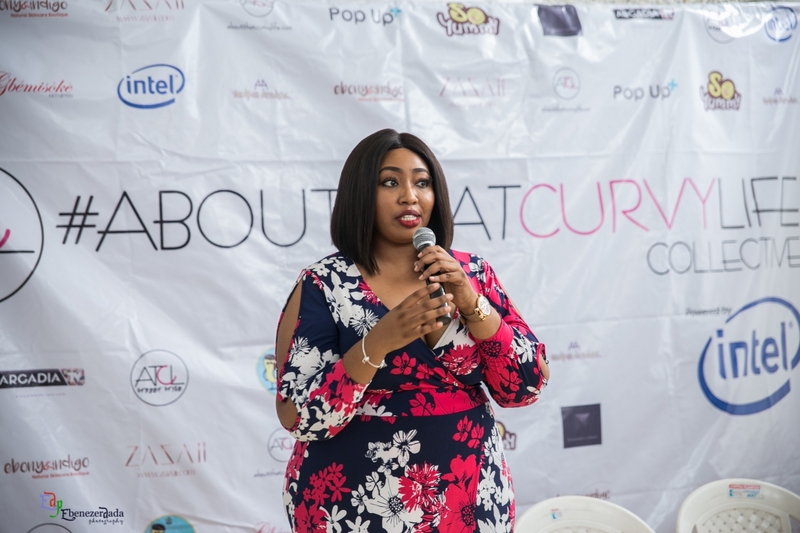 AboutThatCurvyLife.com proudly powered by tech giant, Intel, is set to make Pan African fashion history with its entry at Heineken Lagos Fashion and Design Week 2016. Titled #Aboutthatcurvylife Collective, the runway show will feature five contemporary plus fashion brands consisting of four womenswear lines and one menswear line. This will be the first time in the history of LFDW that a plus fashion show would take to the catwalk. The official announcement was made at a press gathering of writers, presenters, bloggers and fashion influencers held at the ZAZAII showroom in Victoria Island. The purpose of the conference was to announce the selected brands set to showcase in the collective, namely; Maki Olugbile for Makioba, Osa Aisien for MaBello Clothier, Tobi Ogundipe for Tosfa, Aisha Achonu forAisha Abu-Bakr Luxury and Matthew Idang for Assian– each designer will be presenting 6 looks, culminating into a 30-piece strong catwalk. This is a particularly exciting time for the industry as key players like Intel, who understand the value of empowerment and exist to give technological support to platforms like ours. In this digital age, a brand like Intel keeps us connected, allowing us go further with every stroke on our keyboard is definitely one to have on your team and we are super excited they decided to come on board a project like this. Intel itself is no stranger to fashion as it has been the official technological partner of New York Fashion Week for the last couple of years. Their current slogan #IamPowerful is in line with Aboutthatcurvylife’s message of empowerment which affirms a woman’s right to want to feel beautiful, confident and stylish at whatever size. According to the founder of Aboutthatcurvylife.com, Latasha Ngwube; “We could not have been included on Africa’s most organic and progressive fashion event at a more strategic time. All over the world there has been a spotlight on body positivity and fashion inclusion for more than just runway sizes. This year’s theme of “Connecting the dots” is more than just a catchy phrase and we are glad to be a part of Heineken LFDW 2016, thanks to Intel. Bringing this vision to life has been an unforgettable experience so far…my background and decade long experience in the fashion and lifestyle industry prepared me for this role as Creative Director of the #Aboutthatcurvylife Collective and this is only the beginning”. The designers of the collective were handpicked by Ms Ngwube on the basis of their creativity and passion for their craft. Each designer expressed their excitement in taking part in the groundbreaking collective and their aspiration for the local plus fashion industry. They have also been working with veteran model, Andy Ogbechi of AA Squared Network whose expertise has proved invaluable for the models who will be hitting the catwalk. Style Mania Magazine Editor, Godson Ukaegbu is also working with the designers, overseeing their process, ensuring their first outing at fashion week goes well. The #Aboutthatcurvylife Collective will be showing on Wednesday the 26th of October at Heineken Lagos Fashion and Design Week’s Runway Tent in Federal Palace Hotel, Victoria Island and will also be part of the X retail experience with our ATCL x POPUPPLUS sales and exhibition booth . Tickets: Earlybird Specials on Jumia.com, tickets also available at the Venue. ⟵Are Women Less Self-Confident Than Men?